9 When they heard the king, they departed; and behold, the star which they had seen in the East went before them, till it came and stood over where the young Child was. 10 When they saw the star, they rejoiced with exceedingly great joy. 11 And when they had come into the house, they saw the young Child with Mary His mother, and fell down and worshiped Him. 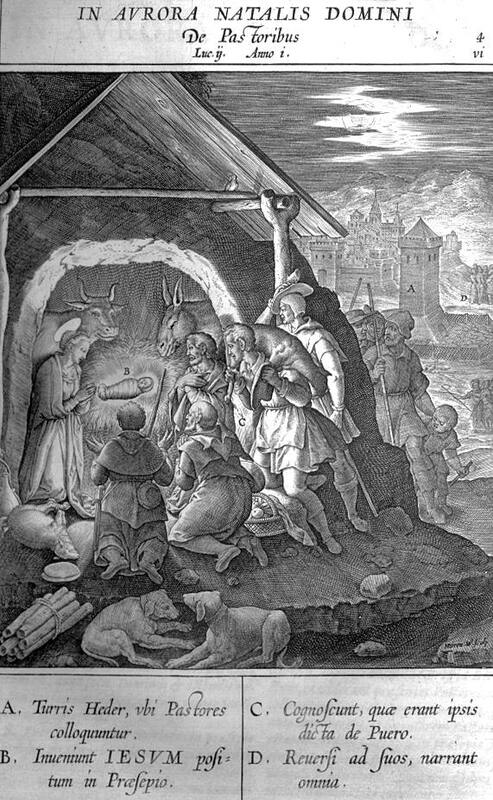 And when they had opened their treasures, they presented gifts to Him: gold, frankincense, and myrrh. 12 Then, being divinely warned in a dream that they should not return to Herod, they departed for their own country another way. 1 Now when Jesus was born in Bethlehem of Judea, in the days of Herod the king, behold, there came wise men from the east to Jerusalem. In the days of Herod, the King. In these words the Evangelist Matthew declares, that the prophecy of Jacob is fulfilled: "The sceptre shall not depart from Judah, nor a law giver from between his feet, until Shiloh come; and unto him shall the gathering of the people be." (Genesis 49:10) As Herod, the alien from Edom, was now governor or king, this was an indication, that Christ, the true King had come; for before the reign of Herod was ended, Christ was already born, that the prophecy might be fulfilled. Christ was the natural King and rightful heir to the throne; but Herod was made king by the sword. Herod was externally a mighty king, successful in war, cunning, etc. ; but internally, in his house, or family, he was unsuccessful; but Christ, our true King, was externally very poor, despised and rejected; but inwardly full of all joy, comfort and courage. There came wise men. No doubt, these wise men were the remnant of those, who had been the scholars or disciples of the prophet Daniel. 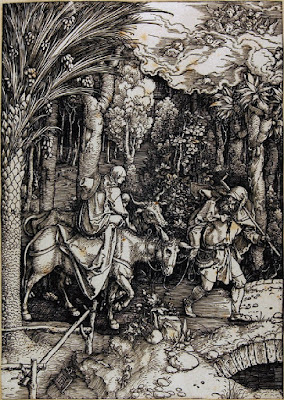 The Evangelist calls them magi; such may be regarded as students of nature; for magic is the art or study of nature or created things; such students of nature were Solomon and others. In imitation of these some have sought to do other things, which are not in nature; these are art-fanatics and sorcerers. Born King of the Jews. The promise given to Abraham, "In thee shall all nations of the earth be blessed," (Genesis 12:3) is here in process of fulfillment; for here God reveals this child, his dear Son, to the Gentiles by such wonderful means, and moves them by the Holy Spirit to seek and worship him. This was a great and wonderful sign to the Jews; him, whom his own nation, the inhabitants and citizens of Canaan, neither seek nor recognize, these strange and foreign people seek and come so many days' journey to find. But when they say "his star" they do not mean that Christ had just created it, but simply that it is a sign of his birth. Also, when they say they came to worship him, they do this, because in the east the kings were worshiped. Herod was troubled. What now is the cause of this fear? Nothing else than this concern, "If this child is to rule, we must become beggars; if this child is to be exalted, then we must be put down." It is the same with the Jews in Jerusalem, as it was with the Israelites in Egypt; this trouble in Jerusalem shows their unbelief; they trusted more in human than in divine power. Demanded where Christ should be born. 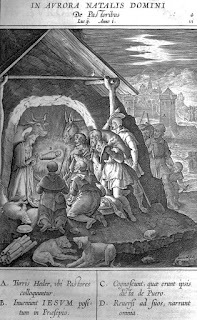 Here we ask why Christ did not permit the wise men to be led by the star to Bethlehem, but required his birth-place to be searched out of the Scriptures. This was done to teach us to be guided by the Scriptures, and not by our imagination, not to follow any human wisdom, example of saints, explanations of the fathers, ghostly aparitions and the like. We seek neither Jerusalem nor Rome, but King Christ in the Scriptures. But here we see how the Scriptures and Christ have three kinds of disciples. 1 The first kind are the Priests and Scribes; they understand the Scriptures and teach them to every body, while they themselves do not live according to them. 2 Another kind are Herod and his people; for Herod also believes the Scriptures. Yet notwithstanding he rises up, and sets his head straight in opposition to God's word and work. 3 The third kind are the pious magi. These are they who openly and freely confess Christ and his truth. 6 And thou Bethlehem, in the land of Judah, art not the least among the princes of Judah; for out of thee shall come a Governor, that shall rule my people Israel. Prince and governor. That which the prophet meant, and yet passed over in silence, the Evangelist expressed and fulfilled, as he looked more upon the spiritual greatness. As he is a Lord and Prince, and yet is not glorious before the world, what can his Lordship be, but that he is mighty and rich in that in which the world is poor. His goings forth. After these words in Micah follows this expression: "Whose goings forth have been from of old, from everlasting." The Scribes did not repeat this to King Herod; yea, probably did not understand it themselves. The prophet wishes to say, I foretell the Lord, who will come from Bethlehem, but he has been before the creation of the world; therefore our true and eternal God must be with him. 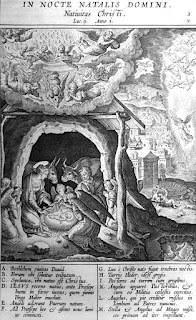 Again, if he is to come in the fullness of time from Bethlehem, he must also be a true natural man. The prophet proceeds in proper order; he writes first of the bodily birth; and of this he speaks more than of the other birth from eternity: for he who would know how our adorable God is disposed towards us, must begin below, and learn what he has done on earth, and how he has revealed himself to men. 7 Then Herod, when he had privily called the wise men, inquired of them diligently what time the star appeared. 8 And he sent them to Bethlehem, and said, Go and search diligently for the young child; and when ye have found him, bring me word again, that I may come and worship him also. Privily called the wise men. Why does he call them privately? Because he feared that if he called them openly, the Jews might anticipate him, and instruct the magi that they should not inform him correctly, in order that the new king might remain in safety. But that he asked them at what time the star appeared to them, was because he thought "The Jews might hide the new king for a time, until he is grown up, then proclaim him and destroy me; therefore I will anticipate them." Rejoiced with exceeding great joy. This is always the experience of the Christian after his adversities. God stands by him, and becomes so cordially sweet and so clear to him, that he not only forgets his fear and adversities, but also gains love and courage to endure still more adversities. 11 If And when they were come into the house, they saw the young child with Mary his mother, and fell down, and worshipped him: and when they had opened their treasures, they presented unto him gifts; gold, frankincense, and myrrh. And saw the young child. Such consolation the wise men needed very much, (verses 9, 10) for in the house they found nothing but poverty and beggary; but they hold fast what they had heard from the prophet Micah, and had seen in the star. Only the Scripture and divine light can reveal the Lord to us. (Matthew 16:17; John 6:44) It does not depend upon whether any one is learned or unlearned, whether he knows much Scripture or not, but he has it, to whom God gives it. We notice that the wise men were not offended at the lowly and poor appearance of the little Child Jesus. 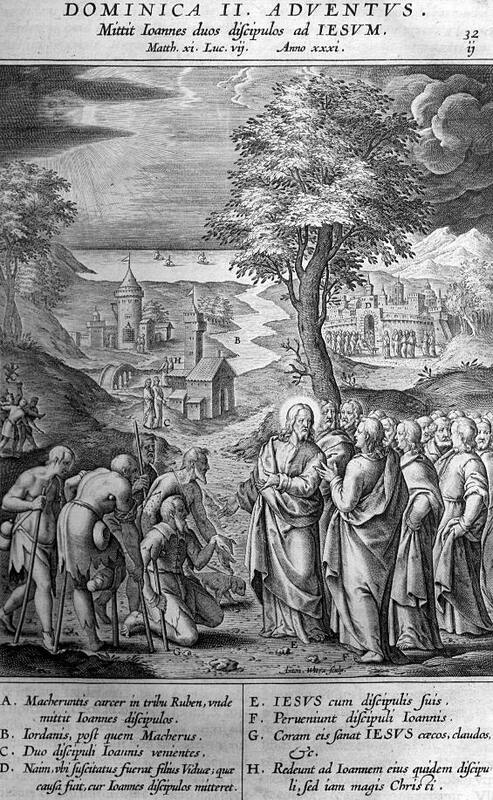 If we would join them in honoring Christ, we must close our eyes to everything that is beautiful and brilliant, and glorious in the estimation of the world, and exercise ourselves in such works as appear foolish and of little importance in the estimation of human reason; for instance, such works as feeding and clothing the poor, consoling the distressed, and helping our neighbor in his troubles. 12 And being warned by God in a dream that they should not return to Herod, they departed into their own country another way. Being warned of God. Thus God will be with us and uphold those who seek and confess the child Jesus, and though they may be in great danger and trouble, yet he will deliver and finally save them. Not return to Herod. 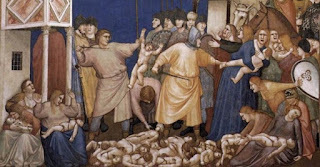 And why does he not let them return to Herod, as he could easily have protected the Child against the whole world? That was done to teach us that we should not tempt God. What we can perform in a proper way and accomplish by natural means we should not despise. You must believe no sooner and no farther than the word of God authorizes. But this is the most noble purpose, that we avoid human tradition and do not fall into it again, after we have once been delivered from it, just as the Magi were loosed from Herod and returned not to him. When they were departed. The an gel could have warned Joseph pre viously, three or more days before ; but our Lord God let it come to the last extremity, when there can be no longer delay. Child and mother. The angel does not say, Take the child, whose father thou art, but take the child and his mother; give the child into the care and protection of his mother only. (Matthew 1:20) . But why did Christ do this, and expose himself to so much trouble and misfortune? Why does he not rather avail himself of his divine power, or the protection and help of the angels, who could easily have removed Herod? Answer: The Holy Scriptures thereby present to our view the Lord, as a natural man, who was like unto us in all things, sin only excepted, as St. Paul says in Philippians 2:7. But here we also see that, although God permits his church to be afflicted, yet we must confess that he truly and faithfully stands by her. Thus God has arranged it through the wise men, that they should provide the necessary means for the Child's support in his flight into Egypt, (see verse 11.) That was doubtless no mean present. Thus God will constantly stand by his word and his church. 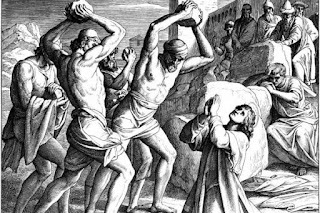 Though tyrants may rage, they must still let his Church and the Word remain; yea more, their rage and persecution shall be the means of increasing the Church and spreading the word of God still farther. There is no doubt of this. Doubtless Mary and Joseph spoke to others of the great wonder connected with this Child, and brought them to faith and salvation. Luther's Explanatory Notes on the Gospels, pp. 13-16. 19 Now when Herod was dead, behold, an angel of the Lord appeared in a dream to Joseph in Egypt, 20 saying, “Arise, take the young Child and His mother, and go to the land of Israel, for those who sought the young Child’s life are dead.” 21 Then he arose, took the young Child and His mother, and came into the land of Israel. When they were departed. The an gel could have warned Joseph previously, three or more days before; but our Lord God let it come to the last extremity, when there can be no longer delay. 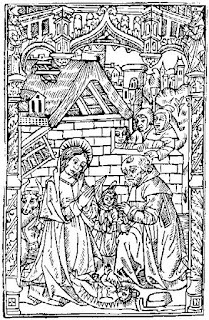 21 And when eight days were completed for the circumcision of the Child, His name was called Jesus, the name given by the angel before He was conceived in the womb. 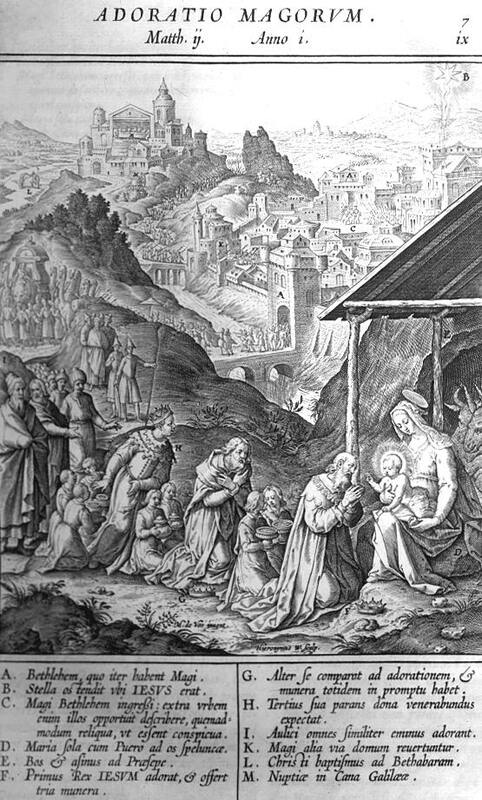 The circumcision of Christ. 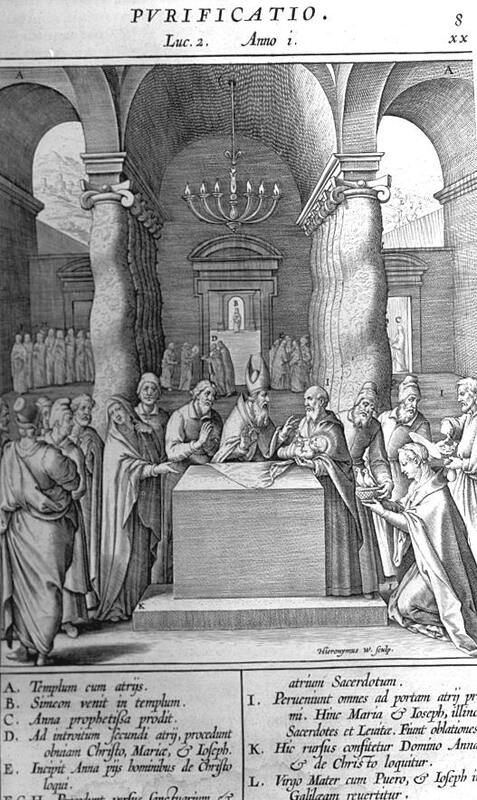 With the eighth day it is meant that the Jewish circumcision should continue no longer than the law; that is, to the time of Christ, who has made an end of the law; for the Scripture keeps this order, that after six days is the Sabbath, and the day following the Sabbath is the eighth day, when a new week begins. Circumcision, like baptism, the Lord's Supper, and adoration of the crucified one, is a humiliation of the haughty nature and reason of men, since it seems to them a ridiculous, senseless and unnecessary command. Now circumcision means nothing else than the cutting off of all that the fleshly birth brings with it. For the spiritual significance of circumcision is this, that there is a lack, not only in the fingers, hand, foot, ears, or any other member of the body; that is, of works, but in the whole disposition of nature, that its birth and all its descent is sin ful; as also the circumcision had to be performed on the eighth day, when the poor child had not yet committed any actual sin. But this spiritual circumcision hurts and is very painful; just as the other (bodily) brought with it shame and pain. Thus this also must bring the same; it must hurt, the Old Adam must submit and come to shame. The difference. But we must make a vast difference between the circum cision of Christ and that of the Jews, as wide as between heaven and earth. For, for his own person our dear Lord had no need of it. He does it for our sake, for we needed such a man, who was without sin, and who fulfilled the law and also appeased the wrath of God. For this reason he subjects himself to the law, bestows this vic tory upon us, which he obtained by the law, that we might use and enjoy it, and henceforth have all that right to the law through him, which he has to the law, that it may henceforth no more condemn us nor hold us in bond age. His name was called Jesus. 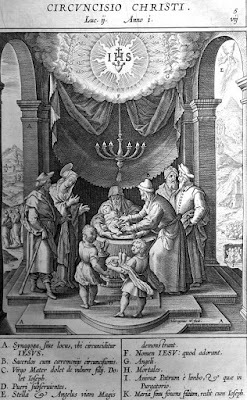 The last part in the circumcision is, that the child receives a name. Before a man is circumcised and by faith puts off the Old Adam, he has no name before God. (Matthew 25:12) But he has a name before God, who is circum cised in spirit. Romans 2:29. Named by the angel. But that he was named Jesus by the angel before he was conceived in the womb, serves this purpose, that every one may know that it is such a name which is pleasing to God, since God himself has called his Son by that name. Let us learn and mark with diligence, that this child is called Jesus, and is a Savior, who came to redeem us from the deepest and greatest distress; namely, from sin, and not from the inferior need and temptation which this life brings with it. Luther's Explanatory Notes on the Gospels, pp. 196. 36 Now there was one, Anna, a prophetess, the daughter of Phanuel, of the tribe of Asher. She was of a great age, and had lived with a husband seven years from her virginity; 37 and this woman was a widow of about eighty-four years, who did not depart from the temple, but served God with fastings and prayers night and day. 38 And coming in that instant she gave thanks to the Lord, and spoke of Him to all those who looked for redemption in Jerusalem. 39 So when they had performed all things according to the law of the Lord, they returned to Galilee, to their own city, Nazareth. 40 And the Child grew and became strong in spirit, filled with wisdom; and the grace of God was upon Him. 20 Then Peter, turning around, saw the disciple whom Jesus loved following, who also had leaned on His breast at the supper, and said, “Lord, who is the one who betrays You?” 21 Peter, seeing him, said to Jesus, “But Lord, what about this man?” 22 Jesus said to him, “If I will that he remain till I come, what is that to you? You follow Me.” 23 Then this saying went out among the brethren that this disciple would not die. Yet Jesus did not say to him that he would not die, but, “If I will that he remain till I come, what is that to you?” 24 This is the disciple who testifies of these things, and wrote these things; and we know that his testimony is true. 34 Therefore, indeed, I send you prophets, wise men, and scribes: some of them you will kill and crucify, and some of them you will scourge in your synagogues and persecute from city to city, 35 that on you may come all the righteous blood shed on the earth, from the blood of righteous Abel to the blood of Zechariah, son of Berechiah, whom you murdered between the temple and the altar. 36 Assuredly, I say to you, all these things will come upon this generation. 6 There was a man sent from God, whose name was John. 7 This man came for a witness, to bear witness of the Light, that all through him might believe. 8 He was not that Light, but was sent to bear witness of that Light. 9 That was the true Light which gives light to every man coming into the world. These verses show what the results and fruits of the word of God are, and the signs whereby we may know whether the word of God is in us and is active. I came across a video that brings home what the Bible says about the Advent of Christ: both His first and His second Advent. The text cited by the old man in the video is the Old Testament lesson for Christmas Day, Isaiah 9:2-7. Beloved, I now write to you this second epistle (in both of which I stir up your pure minds by way of reminder), 2 that you may be mindful of the words which were spoken before by the holy prophets, and of the commandment of us, the apostles of the Lord and Savior, 3 knowing this first: that scoffers will come in the last days, walking according to their own lusts, 4 and saying, “Where is the promise of His coming? For since the fathers fell asleep, all things continue as they were from the beginning of creation.” 5 For this they willfully forget: that by the word of God the heavens were of old, and the earth standing out of water and in the water, 6 by which the world that then existed perished, being flooded with water. 7 But the heavens and the earth which are now preserved by the same word, are reserved for fire until the day of judgment and perdition of ungodly men. It is vital for us as Christians to understand that the sin denying and prosperity teaching liars like Joel Osteen, Rob Bell, Mark Driscoll and many other pop-Evangelical American teachers are undercutting and destroying the faith once delivered to all the saints. They are not preaching Christ crucified for the forgiveness of sins. Instead they are preparing their listeners to fall into pressure to give up. Christmas, the first Advent of our Lord, is a day the true Church uses to focus on the gift of God Who chose to become also a human baby boy. He truly is Immanuel, "God With Us" and our Savior. The video was filmed in Hyde Park, London, England and uploaded in February 2015. At the heart of the video is the prophecy from Isaiah chapter 9. This prophecy is of the first Advent, the coming of Christ in the flesh. Lifting up and praising God with vague lofty choruses that make no reference to sin, grace, the means of grace, or the forgiveness of sins in Christ will not prepare any Christian for a confrontation like this. Focusing on what God can do for me now to make my life, my retirement, my stress better does not prepare any Christian for this kind of confrontation. It is only the solid preaching of the actual written Word of God, His Law, His Gospel, the very words of His prophecy and fulfillment in Christ and dwelling in His means of grace that can prepare any of us for this day. That, my friends, is exactly what the liturgy of the Divine Service does. This is exactly what Confessional Lutheranism is preparing us for by teaching the Small Catechism. Surrounded by the enemies of Christ, this man, however imperfectly, was enabled by God to preach forgiveness in the Christ. He directed them specifically to the promise of Christmas in Isaiah 9. His speech to his persecutors is also a prayer for them, their forgiveness, their deliverance. It must come with warning. Christmas is such a warning as well as a promise. 1 And it came to pass in those days that a decree went out from Caesar Augustus that all the world should be registered. 2 This census first took place while Quirinius was governing Syria. 3 So all went to be registered, everyone to his own city. 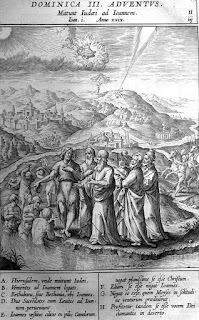 4 Joseph also went up from Galilee, out of the city of Nazareth, into Judea, to the city of David, which is called Bethlehem, because he was of the house and lineage of David, 5 to be registered with Mary, his betrothed wife, who was with child. 6 So it was, that while they were there, the days were completed for her to be delivered. 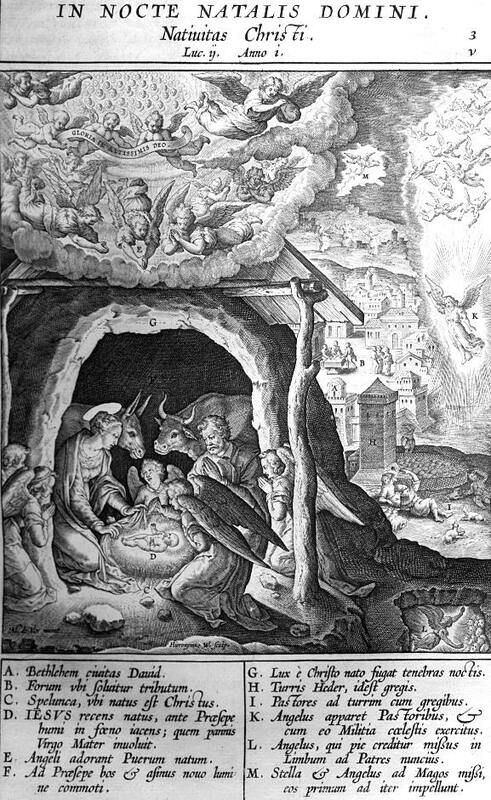 7 And she brought forth her firstborn Son, and wrapped Him in swaddling cloths, and laid Him in a manger, because there was no room for them in the inn. 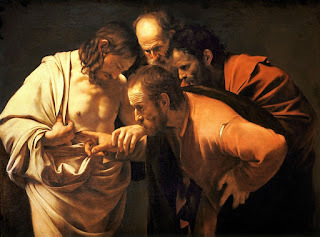 The doubting Thomas. Yes, you say, but who knows whether it is certain and sure with God, that my sins are forgiven? 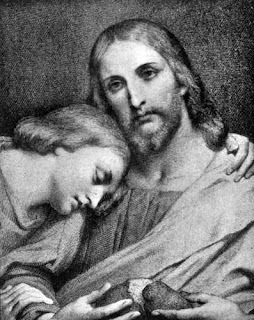 Rest upon what Christ says here, verses 21 and 23, and elsewhere (Matt 18:20) "Where two or three are gathered together in my name, there am I in the midst of them." 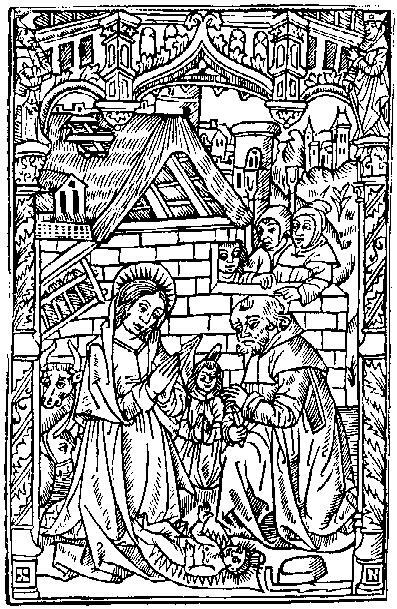 Luther's Notes on the Gospel: Fourth Sunday in Advent - Rejoice! as the prophet Isaiah said.” 24 Now those who were sent were from the Pharisees. 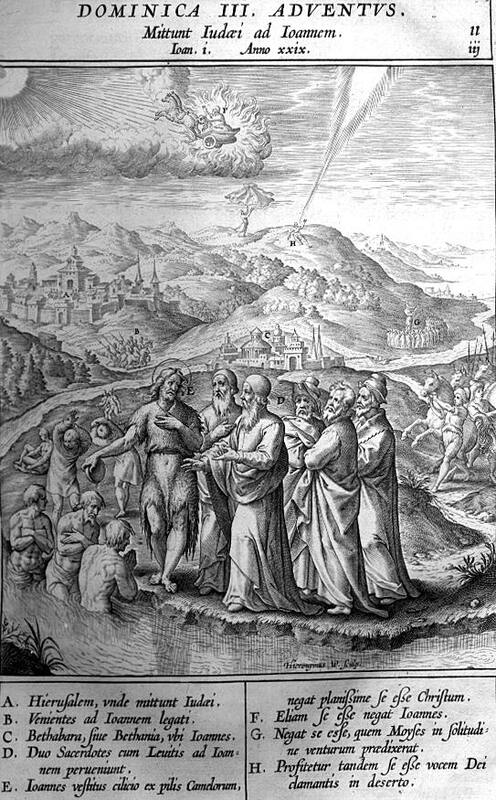 25 And they asked him, saying, “Why then do you baptize if you are not the Christ, nor Elijah, nor the Prophet?” 26 John answered them, saying, “I baptize with water, but there stands One among you whom you do not know. 27 It is He who, coming after me, is preferred before me, whose sandal strap I am not worthy to loose.” 28 These things were done in Bethabara beyond the Jordan, where John was baptizing. 2 Now when John had heard in the prison the works of Christ, he sent two of his disciples, 3 And said unto him, Art thou he that should come, or do we look for another? John sent two of his disciples, It is certain that John sent to inquire on account of his disciples; for they did not yet regard Christ as the one for whom he was to be regarded; they waited for one who would move along pompously, highly learned, as a high priest, or a mighty king. One of the modern claims against Christmas is that Christians took the ancient Roman holiday known as Brumalia and baptized it for their own use. The claim is that Brumalia was celebrated in ancient Rome on December 25th. And the claim is that it was a widely known and celebrated holiday in pre-Julian ancient Rome. I am working through the Latin literature and putting together translations for the Julian/Late Antiquity periods as well. But, God willing, that will be finished some time next year. This article deals with the pre-Julian period of the Roman Republic. The New Schaff-Herzog Encyclopedia of religious knowledge explains, "Christmas, the date of the festival depended on the pagan Brumalia (December 25) following the Saturnalia (December 17-24), celebrating the shortest day of the year and the new sun. But that is not what the New Schaff-Herzog Encyclopedia actually says. What it says, after showing the origins of the use of December 25th in some of the Church Fathers (e.g. 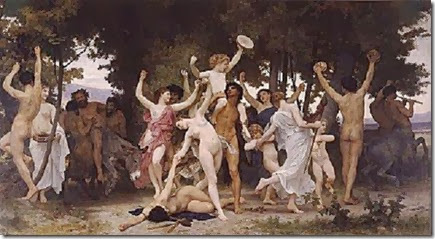 Hippolytus, and Clement) the article raises the issue of whether the date was related to Roman pagan practices.